For most people, it’s usually possible to find fresh fruit. But, in some instances, such as when traveling, it’s handy to have a portable, stable form of fruit. 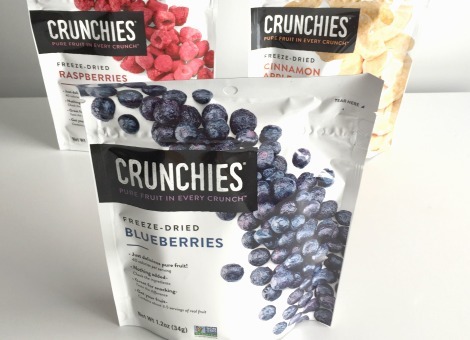 Crunchies, an all-natural line of freeze-dried fruits, fits well into this category. Numerous studies report that freeze drying is one of the better technologies available to preserve the nutrient and phytochemical content of various foods – including fruit. And, best of all, Crunchies are made almost exclusively of freeze-dried apples, blueberries, purple grapes, raspberries, strawberries and other nutritious fruits. It should also be noted that the sugar content of freeze-dried fruit is dramatically lower than that of conventionally dried fruits like black currants, “craisins” and figs. My two favorite Crunchies products are their blueberries and strawberries. In fact, many of the high profile studies conducted on these berries used freeze-dried (FD) berry powders. In the case of blueberries, current research indicates that they improve antioxidant status, blood pressure and circulatory health without raising blood sugar. FD strawberries have an even stronger track record in the medical literature. Individuals who consume FD strawberries on a daily basis show a myriad of health benefits, including reduced HbA1C (a measure of long term blood sugar), inflammation, LDL cholesterol and post-meal insulin. Most of the positive effects relate to cardiometabolic health i.e. diabetes, heart disease and metabolic syndrome. Having said that, other intriguing findings have been discovered, such as enhanced immunity in overweight adults. I’m well aware that many of my readers are following low carbohydrate diets. Understandably, the thought of introducing more fruit into that paradigm may be worrisome. My advice is simply to try it out. Test your blood sugar using a home glucometer. If your personal results are acceptable, then follow up by having your HbA1C tested by your doctor a few months down the line. In all likelihood, the majority will find that their blood sugar isn’t adversely affected by these low-glycemic fruits. For what it’s worth, my own testing revealed minimal effects on blood sugar when I coupled FD fruit with meals and snacks that were high in healthy fat and moderate in protein. Meal Example: Sardine Bowl and a 1/4 cup serving of Crunchies for dessert. Snack Example: A handful or walnuts and a 1/4 cup serving of Crunchies. In the interest of full disclosure, I was provided with an assortment of Crunchies products in order to evaluate my blood sugar response and taste preferences. I can honestly say that I enjoyed the flavors I tried, especially the clean, subtle sweetness and crisp texture. My favorite in terms of taste is the cinnamon apple which reminds me of apple pie. It features only two ingredients: FD apple slices and cinnamon. I didn’t experiment with the banana-strawberry or pineapple flavors, although my 2 year old niece devoured the banana-strawberry Crunchies like it was candy. High praise! A few notes for the makers of this product line: I’d like to see more information on your packaging and website about the purity of your fruit supply. They’re described as farm-fresh and non-GMO, but not listed as organic. It would be interesting to know what steps are taken to ensure minimal levels of pesticide residues. If you plan to expand your product line, I’d like to suggest black raspberries and kiwi fruit. FD black raspberries show enormous potential in the realm of cancer prevention and metabolic syndrome. They’re low in sugar and a great source of antioxidants and fiber as well. FD kiwi has prebiotic properties that promote regularity. This would be a great fit for frequent flyers who contend with occasional traveler’s constipation. Something to consider! J Med Food. 2016 Feb 18. Black Raspberry Extract Increased Circulating Endothelial Progenitor Cells and Improved Arterial Stiffness in Patients with Metabolic Syndrome: A Randomized Controlled Trial. Administration of black raspberry (Rubus occidentalis) is known to improve vascular endothelial function in patients at a high risk for cardiovascular (CV) disease. We investigated short-term effects of black raspberry on circulating endothelial progenitor cells (EPCs) and arterial stiffness in patients with metabolic syndrome. Patients with metabolic syndrome (n = 51) were prospectively randomized into the black raspberry group (n = 26, 750 mg/day) and placebo group (n = 25) during the 12-week follow-up. Central blood pressure, augmentation index, and EPCs, such as CD34/KDR+, CD34/CD117+, and CD34/CD133+, were measured at baseline and at 12-week follow-up. Radial augmentation indexes were significantly decreased in the black raspberry group compared to the placebo group (-5% ± 10% vs. 3% ± 14%, P < .05). CD34/CD133+ cells at 12-week follow-up were significantly higher in the black raspberry group compared to the placebo group (19 ± 109/μL vs. -28 ± 57/μL, P < .05). Decreases from the baseline in interleukin-6 (IL-6) and tumor necrosis factor-alpha (TNF-α) were significantly greater in the black raspberry group compared to the placebo group (-0.5 ± 1.4 pg/mL vs. -0.1 ± 1.1 pg/mL, P < .05 and -5.4 ± 4.5 pg/mL vs. -0.8 ± 4.0 pg/mL, P < .05, respectively). 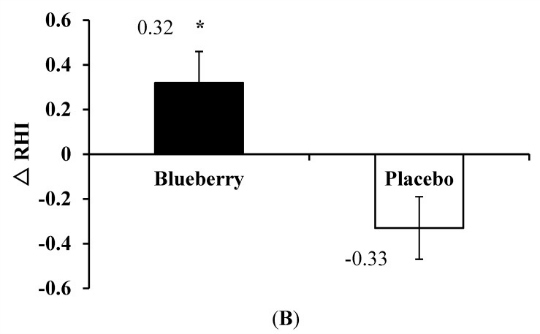 Increases from the baseline in adiponectin levels (2.9 ± 2.1 μg/mL vs. -0.2 ± 2.5 μg/mL, P < .05) were significant in the black raspberry group. The use of black raspberry significantly lowered the augmentation index and increased circulating EPCs, thereby improving CV risks in patients with metabolic syndrome during the 12-week follow-up. J Food Sci. 2015 Apr;80(4):H869-74. Evaluation of protective effect of freeze-dried strawberry, grape, and blueberry powder on acrylamide toxicity in mice. Berries are dietary plants with high antioxidant activity. The aim of this study is to investigate the protective effect of berries (strawberry, grape, and blueberry) against the acrylamide (AA)-induced general toxicity, genotoxicity, and reproductive toxicity in mice model, respectively. Mice were treated with 50 mg/kg b.w./day AA intraperitoneal injection for 5 d after feeding control diet or diet containing freeze-dried strawberry, grape, and blueberry powder. The results showed that AA induced a significant general toxicity, genotoxicity, and reproductive toxicity in mice. Compared with the control diet, the diets containing berries could reverse the AA-induced alterations in liver antioxidant enzymes activities (P < 0.05). Moreover, the AA-induced genotoxicity could be prevented by the diet containing berries. The DNA damage in the lymphocyte and liver cells and the micronucleus formation in bone marrow cell were significantly alleviated (P < 0.05). Meanwhile, the mice fed with diets containing berries showed a recovery in the sperm count, the sperm activity rate, sperm motility parameters, and the abnormal sperm rate (P < 0.05). Berry powders have remarkable intervention against the AA-induced general toxicity, genotoxicity, reproductive toxicity. Abundant phenolics, especially anthocyanins, may contribute to the intervention. A grape-enriched diet increases bone calcium retention and cortical bone properties in ovariectomized rats. BACKGROUND: Grapes and their associated phytochemicals have been investigated for beneficial effects on cardiovascular health, cancer prevention, and other chronic diseases, but the effect of grape consumption on bone health has not been fully determined. We previously found short-term benefits of grape products on reducing bone turnover in ovariectomized rats. OBJECTIVE: The objective of this study was to determine the long-term benefits of a grape-enriched diet on bone in ovariectomized rats. METHODS: Rats were ovariectomized at 3 mo of age and were administered a single dose of (45)Ca to prelabel bones at 4 mo of age. After a 1-mo equilibration period, baseline urinary (45)Ca excretion was determined. Rats (n = 22/group) were then randomly assigned to a modified AIN93M diet containing 25% freeze-dried grape powder or to a control diet for 8 wk. Urinary (45)Ca excretion was monitored throughout the study to determine changes in bone (45)Ca retention. Calcium balance was assessed after 1 and 8 wk of consuming the experimental diets, and a calcium kinetic study was performed at 8 wk. After 8 wk, femurs were collected for micro-computed tomographic imaging, 3-point bending, and reference point indentation. RESULTS: Rats fed the grape-enriched diet had 44% greater net bone calcium retention than did rats fed the control diet. There were no differences in calcium balance due to diet at either week 1 or week 8, but there was a significant increase in net calcium absorption (10.6%) and retention (5.7%) from week 1 to week 8 in the grape-enriched diet group only. Grape-enriched diet-fed rats had 3% greater cortical thickness and 11% greater breaking strength. There were no differences in femur bone mineral density, trabecular microarchitecture, or reference point indentation variables due to diet. CONCLUSION: This study of ovariectomized rats indicates that the consumption of grape products may improve calcium utilization and suppress bone turnover, resulting in improvements in bone quality. Nutr J. 2016 Mar 5;15(1):23. Pairing nuts and dried fruit for cardiometabolic health. … “One study involved 47 adults aged 68 and older, who had mild cognitive impairment, a risk condition for Alzheimer’s disease. The researchers gave them either freeze-dried blueberry powder, which is equivalent to a cup of berries, or a placebo powder once a day for 16 weeks. British Journal of Nutrition, available on CJO2016. Effects of a dietary strawberry powder on parameters of vascular health in adolescent males. Previous studies have shown that the intake of freeze-dried strawberry powder (FDSP) improves select markers of cardiovascular health in adults with cardiovascular risk factors; however, whether these improvements can be observed in at-risk adolescents is unknown. A randomised, double-blind, cross-over study enrolled twenty-five overweight or obese males, aged 14–18 years, to consume 50 g of a FDSP or a control powder, daily for 1 week. Before and after each test period, measures of microvascular function, plasma nitrate/nitrite, platelet reactivity and blood lipids were collected at baseline and acutely 1 h after FDSP intake. Acute plasma nitrate/nitrite levels increased 1 h after consuming the FDSP during Study Visit 1 before daily FDSP intake (P<0·001) and during Study Visit 2 after 1 week of FDSP intake (P<0·001) compared with control powder intake. As a group, fasting nitrate/nitrite levels did not significantly change after 1 week of control or FDSP intake. However, for those individuals where fasting nitrate levels increased after short-term FDSP intake compared with controls, an increase in reactive hyperaemia index (RHI) was observed (P=0·014), whereas RHI was unchanged in those individuals who did not have a significant increase in nitrate (P=0·396). Taken together, these data support the concept that strawberries can provide vascular health benefits to heavier adolescent males.